PHILADELPHIA, PA (April 1, 2019) – Multi-platinum global superstar Khalid has revealed details of his North American headline dates for the “Khalid Free Spirit World Tour”, which includes a stop at Wells Fargo Center on Sunday, August 11. Tickets go on sale Friday, April 5 at 12 p.m. online at WellsFargoCenterPhilly.com, by phone at 1-800-298-4200, or in person at the Wells Fargo Center box office. 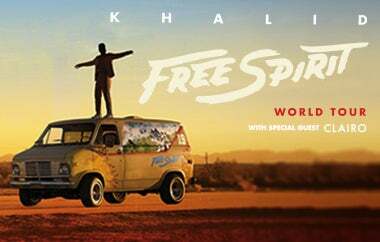 Every ticket purchased online to Khalid’s Philadelphia tour stop will include one CD copy of “Free Spirit”, Khalid’s upcoming sophomore album. Khalid has enlisted friend Clairo, the 20-year-old “Pretty Girl” singer-songwriter, to appear as special guest on his summer tour. Comcast Spectacor is a professional sports and live entertainment company that is part of Comcast Corporation, a global media and technology leader that operates Comcast Cable, NBCUniversal and Sky. Headquartered in Philadelphia, Comcast Spectacor owns and operates the Wells Fargo Center arena and complex, as well as a portfolio of professional sports teams that includes the National Hockey League’s Philadelphia Flyers, the Overwatch League’s Philadelphia Fusion, the National Lacrosse League’s Philadelphia Wings and the Maine Mariners of the ECHL. Comcast Spectacor also holds strategic interest in several partner companies spanning the sports and entertainment landscape, including Spectra, Learfield, Xfinity Live! Philadelphia and N3rd Street Gamers. Visit us at ComcastSpectacor.com for more information.